I wanted to share my entry that I submitted to the Copic Australia Card Challenge. The challenge was to use the colours E02, Y06 and BV06, which translate to a skin colour, a bright yellow and a lovely mauve. This was my first ever entry into any sort of competition relating to stamping/papercrafting and it was even a bigger deal to have to use my Copics. I have had them for nearly a year and whilst they are beautiful to work with, I have been immensly intimidated by them. I was really, really happy with how this turned out. I used the requisite colours as follows: E02 was the base colour for the orange flowers, which were given depth (I hope) with YR02 and YR04 - I think. I did have all the colours written down but I can't find them now. Y06 was used in the flower centres and BV06 was the base colour for the purple flower. I'm pretty sure that the pink flowers started with a base of RV10. (I will update with the correct additional colours once I find where I've put the listing). I drew the frame using my Black Stampin' Write Journaller and a ruler, the sentiment is from Papertrey Ink, stamped in Memento Black, as are the flowers, which come from the SU! Fifth Avenue Floral set. 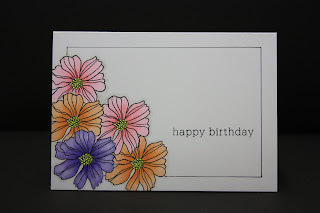 The cardstock is also from Papertrey Ink. Hi Jo, This is a lovely simple and elegant card. Well done on entering it in the competition.